It’s setting up to be the biggest year ever for the BB&T Atlanta Open, Atlanta’s ATP World Tour 250 event held each summer and ATP No. 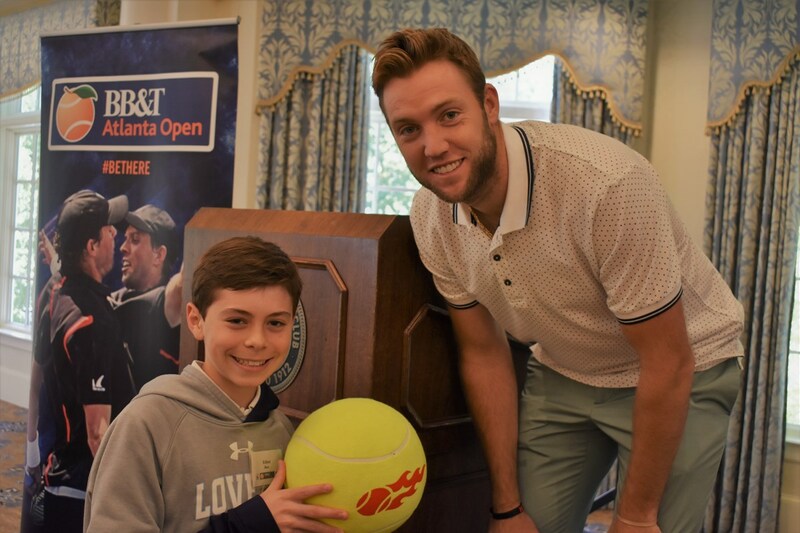 16, and one of the top American men’s tennis professionals, Jack Sock, made the rounds in Atlanta to promote this year’s event. The 2018 BB&T Atlanta Open will kick off the U.S. Open Series from July 21 to July 29, 2018, at Atlantic Station. Ticket offerings for the nine day men’s tournament and the women’s exhibition match, featuring Sloane Stephens and Madison Keys are on sale at www.bbtatlantaopen.com. John Isner and Bob and Mike Bryan, of the Bryan Brothers, announced their return in July 2018, to defend their titles and Sock and 2017 finalist, Ryan Harrison will also join them. Isner committed to a 2018 return to vie for his fifth possible singles title in Atlanta; he currently holds the tournament record with an impressive four singles trophies (2013, 2014, 2015 and 2017). Still a dominant force at the age of 32, the former University of Georgia All-American is currently the top-ranked American male player at No. 14 in singles and is wrapping up a strong year on the ATP World Tour. He holds 12 singles titles at the ATP World Tour 250 level and many remember his win over Nicolas Mahut, over the course of 11 hours and 5 minutes of play and three days at Wimbledon in 2010. Now in it’s eighth year, the one constant at the BB&T Atlanta has been the 6’10” native of Greensboro, N.C. Isner sports a 27-4 career mark in Atlanta and each year credits loyal Atlanta tennis fans as one of the reasons for his success. Reigning doubles champions, the Bryan Brothers, will defend their title with their third BB&T Atlanta Open appearance. Hailed as the “winningest doubles team in history,” the duo has won 116 ATP World Tour doubles titles, including the 2015 and 2017 BB&T Atlanta Opens. The winners of six Grand Slam titles and Olympic Gold and Bronze medals have finished No. 1 as a team in the ATP World Tour rankings 10 times. Sock said he loves playing in Atlanta. Sock’s rounds over Tuesday and Wednesday of this week included the Twelve Hotel in Midtown, Bitsy Grant Tennis Center, Fox 5, 680 the Fan, and Druid Hill Golf Club. -High School: Finished high school tennis career with an 80–0 record and four consecutive state championships in singles. 2010: 2010 — Won USTA Boys’ 18s Nationals to earn a wild card into US Open main draw. Won US Open boy’s singles title. First American to win that title since Andy Roddick. 2015: Won first ATP World Tour singles title at 2015 US Clay Court Champs in Houston d. Querrey in finals. 2016 Rio Olympics: He won the gold medal in the mixed doubles with Bethanie Mattek-Sands and captured a bronze medal in the men’s doubles with Steve Johnson. Get your tickets now for a fun week of tennis in July at Atlantic Station.